The 2011 LinuxQuestions.org Member’s Choice Awards voting is going on now and Nagios is a candidate for the best Network Monitoring Application. 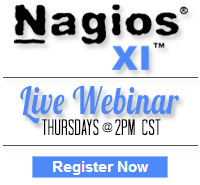 Show your love for Nagios by voting in the poll. The poll closes this Thursday (February 9th), so don’t delay. NOTE: If you haven’t participated on the LQ forum, before you’ll have to create an account and post a new message before you can vote. Our team is excited that Nagios was just awarded Best Web Tool by the folks at WebHostingSearch.com.